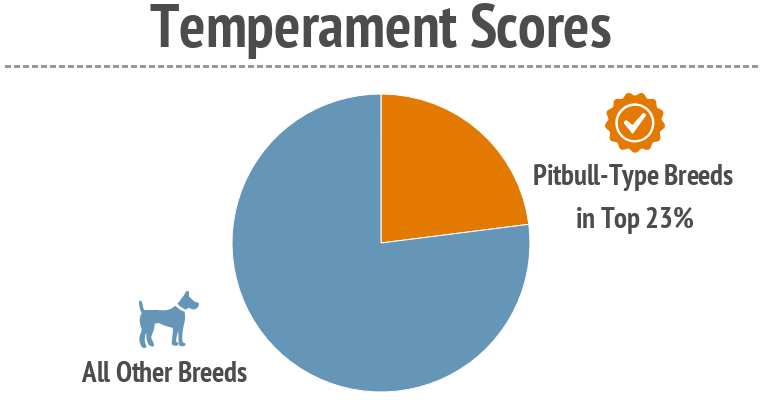 According to the latest ATTS breed temperament test data, the unique breeds commonly assigned to the broad "pitbull-type" category continue to achieve excellent temperament scores - scoring in the top 23% of all breeds tested. Furthermore, the average score for pitbull-type breeds was better than 100 of the 130 breeds included in this statistic - in other words, in the top 30 of 130 breeds tested (top 23%). The ATTS data reflects similar conclusions found in scientific studies and provides further evidence that the behavior, trainability, and overall disposition (all factors related to temperament) of pitbull-type dogs is excellent. The data, sources, and scores used for this statistic are all provided below. This statistic includes the 130 breeds that have a test size of 25 or more dogs using the latest available ATTS breed temperament test data (December, 2017). Average score of 87.9% for pitbull-type breeds is higher than 100 (or 77%) of 130 breeds tested. Average score of 87.9% for pitbull-type breeds is in the top 30 (top 23%) of 130 breeds tested. Note: To date, the American Bully (the 4th breed commonly assigned to the broad pitbull-type category) has not been included in ATTS testing, so this breed's score is currently unavailable. The American Bully should not be confused with the American Bulldog (ATTS score: 86.9%) which is a unique breed that is not considered a "pitbull-type" breed.